Surprise, excitement, curiosity, but more than anything: honor. 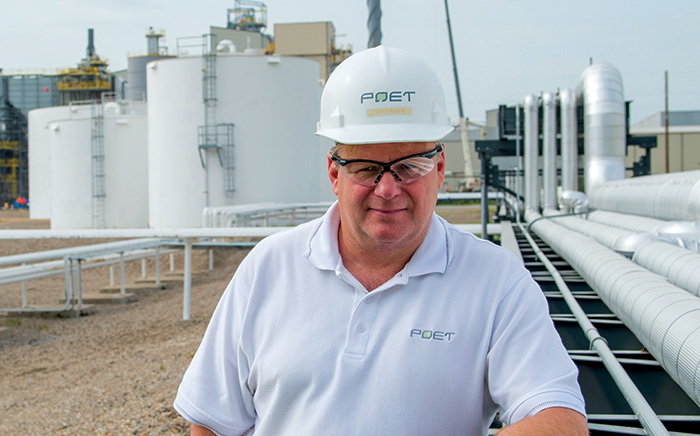 Those feelings rolled together through my mind when I first heard years ago that POET Biorefining – Emmetsburg would be the home of the project that had internally been codenamed “LIBERTY.” This was going to be something revolutionary, much more than another ethanol plant. Even so, I had no idea just how big – both physically and symbolically – this would be. I was familiar with the concept of cellulosic ethanol, just as all of us who work in the ethanol industry are. But understanding something from the 30,000-foot level and understanding it with the level of detail that the general manager of a plant needs to have are two very different things. I had no idea what this would look like, and the more I thought about operations, the more questions I had. It quickly became clear that our plant was not going to be going it alone in this project. POET Design and Construction was not going to just design and build a plant and then roll out of town. This was a POET (and later, POET-DSM) project that would make all the resources in the company available. We have been from the start a team made up of strong leadership from the very top of POET and DSM along with experts in every field from every department. Experts in emissions, permitting, automation, human resources, communications, IT, engineering, chemical processes, environmental health & safety, management, feedstock and more focused their talents on making this project a success from the start. Looking at it as a whole, it certainly appeared to be a daunting task. But like any other challenge, it became more manageable as our teams broke it down into smaller pieces. As the general manager, I try to be involved in everything, but with so much talent around me, I could see that the best strategy was often to just step back and let people do what they’re good at. We’ve moved bit-by-bit through every step to get to where we are today, and it’s been such an honor to witness this process. I’d be lying if I said this project hasn’t also included stress. This is uncharted territory; when you run into a problem, you can’t just pick up the phone and call someone who has dealt with it before. We work together to come up with our own answers, and many times what looks like the right answer today, might not be the right answer tomorrow. That’s part of the learning process. But the things that make this project stressful are the very things that make it so special. We get to be the first. And 10 years down the line, when another cellulosic ethanol plant runs into a challenge, we’re the ones they’ll call. The feelings I have had about Project LIBERTY are also present in many of the people in this area, and just like I didn’t initially understand the scope of what was going to happen, neither did they. I got a phone call at 5:45 one morning from a good friend and local farmer, Charlie Kolasch. “I’m sitting in the Casey’s parking lot, and I can’t get in to get my coffee and roll because it’s packed with construction people!” he said. That’s another side of the project that I’ve been blessed to witness: its effect on the community. We’ve changed this area’s economy and given it another point of pride. Their partnership in this has been so valuable. “We embrace change,” is one of the principles that POET reinforces with all its teams, and I have to imagine that there’s no group that lives by that motto more than the people involved with Project LIBERTY. “Change” really is the only constant here, and it’s the reason that even today, moving toward full operation of a commercial scale cellulosic ethanol plant, I have the same feelings I had at the very beginning. Surprise, excitement, curiosity, but more than anything: honor.